Bleurgh, Monday morning AGAIN. Comes round quickly doesn’t it? Now, we all know I’m a fan of the humble sweatshirt, and I love this striped version. Just add a statement necklace, boyfriend jeans and a pair of neon heels and you’re good to go! Monochrome and the Sixties influence were all over the SS’13 catwalk, thanks to Marc Jacobs and his collections for Louis Vuitton and his own label. If you wanted to tap into that trend in a subtler way than a crop top and matching maxi, this top may just be for you. Pair it with pastel crops and pointy flats for the full effect. Also big news for this season is the cut out shoulder top, or as the fash peeps have termed it, the ‘cold shoulder’. This trend could be a good friend to me as I have toned, but broad shoulders from years of swimming, so halternecks are a big no-no. This red top would be an easy way for me to show off my shoulders without looking like a henchman in drag. I’d wear in with indigo skinnies and leopard heels. 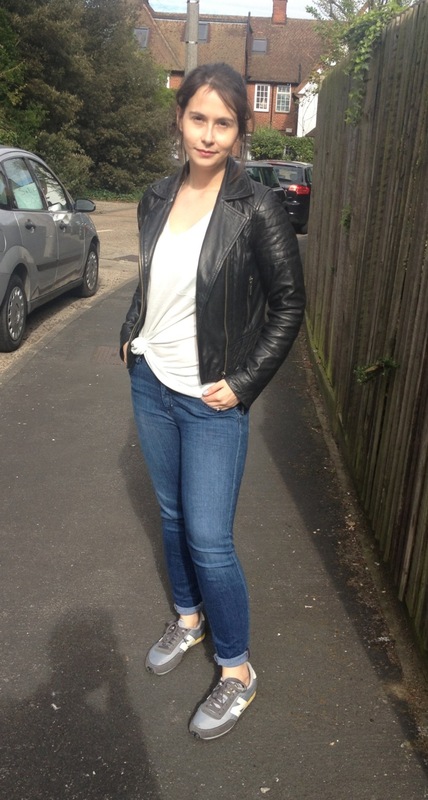 If you like the leather jacket I’m wearing in this post then you might well be a fan of this one, as it is very similar. My jacket came from Oasis a couple of winters ago and is holding up brilliantly so far. It is soft, thick and, I think, great value for the price. If you were wondering about a way to wear the oriental trend without resorting to a kimono (because, let’s face it, it’s a serious issue…), I may have the answer in the shape of this bomber jacket. Now I know the bomber jacket isn’t for everyone, but I think is floral version is very pretty. I’m imagining it slung over a simple black tank, white jeans and single-strap heeled black sandals for a chic summer evening look. Oasis’ Cherry skinny jeans hae been around a while now, and while I haven’t tried them yet myself, I have many friends who really rate the fit. THey have been updated for SS13 in this distressed finish. I have long been a fan of a slightly beaten up pair of denims, and I think these would look great with a white vest and a pair of high tops. It’s no understatement to say that having my colours analysed was the best money I’ve ever spent from a sartorial perespective (more on this in a future post), but I do miss being able to wear yellow. I’m not a slave to the rules, and any expert will see I cheat quite regularly, but even I have to admit that yellow fabrics against yellow skin is not a good look. Therefore I will have to live vicariously by recommending this pretty scarf. The last item on my list is this pair of tan leather sandals. I really like the chunky straps and the simplicity of the style. And £26 for leather? I think they’d be the perfect, go-with-everything summer shoe. I’m experimenting with all my old jeans this weekend. Today a pair of Uniqlo straight legs that pre date my children, these hold a special place in my heart as they were the first pair of ‘normal’ jeans I managed to squeeze back into after I had my little boy. Naturally this means they are a bit roomy, so I’ve rolled them up and made them into DIY boyfriends. I’m wearing them with a simple micro-stripe top, tan suede ankle boots, a leather biker and bright accessories.